Sometimes a person wonders why nonsense movies like “The Hurricane Heist” are being made. It’s a mixture of “American Heist” with “Into the Storm“. 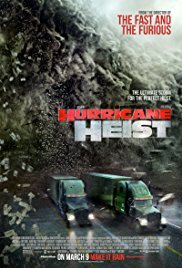 Actually, this disaster film (all aspects of this movie are kind of a disaster by the way) looks like “Den of Thieves“. Here too a gang of criminals get the bright idea of stealing money which is doomed to go through the paper shredder. Money that’s about to be taken out of circulation and so no longer will exist. Only the savvy bank robbers hoped that the authorities would think that the stolen money (squeezed in three whoppers of trucks) disappeared because of an onrushing hurricane (category 5). The amount of money they want to steal is around $ 600 million. The makers had better raised their budget with a few million too, so they could improve the rattling script, a few failing actors and the lousy special effects. At some level it really was a disaster.